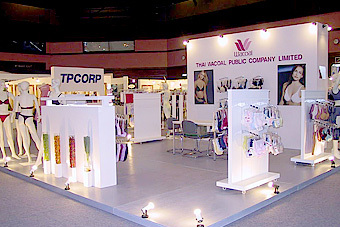 Thai Wacoal Public Company Limited was established through joint-venture investments between Saha Pathanapibul Company Limited and Wacoal Corporation of Japan on October 1, 1970, as the first ladies' lingerie products manufacturer on an industrial basis in Thailand. In 1983, the company became a listed company on The Stock Exchange of Thailand, and later on in 1994 was transformed into a public company. Today, the company was engaged in manufacturing operations for ladies' apparel products, covering the range of ladies' lingerie, ladies' outerwear, and childrenwear, with ladies' lingerie category serving as the core product group for the company. With regard to the distribution of its products to the domestic market, I.C.C. International Plc. was appointed as the company's major distributor. Whereas for its export business operations, the company exported its products to affiliated companies under Wacoal Corporation, to major country destinations such as Japan, the U.S., and ASEAN countries. 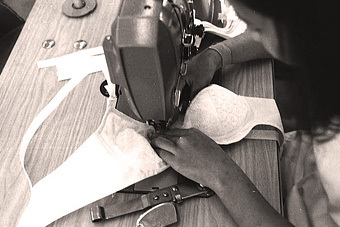 1970 Started to produce lingerie products. 1971 Expanded the production to cover girdle, underwear, short bodysuit, petticoat and nightwear products. 1972 The company started to export to overseas market for the first time. The company further added children wear and outerwear products to its product line-up. 1973 Increased the registered capital from 4 million baht to 8 million baht. 1974 Started production for children wear to distribute locally. 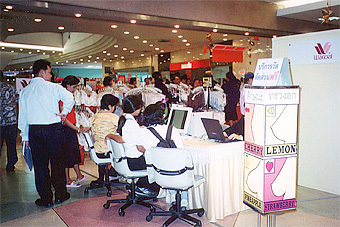 1979 Increased the registered capital to 20 million baht. The First Decade is the pioneer stage of lingerie products, which employed marketing and innovation strategies for new products and services, such as arrange salespersons to give suggestions to customers so as to choose lingerie products which fit each individuals' physiology. The company is also the first to use the special term for lingerie salesperson as "Proportion Consultant" or "PC", which has become widely used today. The company also arranged for "Fitting Room" at stores and is the first to introduce the Cup and Size System as well as determine the lingerie products at fixed price. The company is also the first brand to air the lingerie advertisement on television in Thailand. As a result, the product brand became widely known and totally changed the behavior and concept of women towards lingerie products. 1980 Changed the company logo from to the due to the 10thYear Anniversary of its establishment on 1st October 1980. The logo looks like a blooming flower, which represents progress of the company. The color code for the company is red-wine and pink. 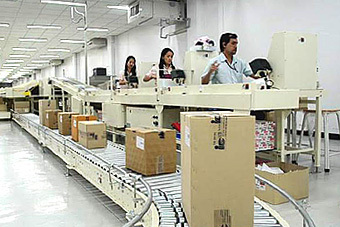 The computer system was introduced in the production line for the first time. Joint-ventures with many raw materials producers to study and develop new raw materials with equal quality to foreign countries. As a result, it replaced more than 90% of import. 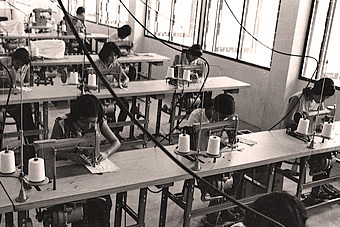 1984 Expanded production by establishing the SR.W.Garment Company Limited at the Saha Group Sriracha Industrial Park, Cholburi. The company also launched "Wacoal Computer Service" to provide the proportion measurement service to customers with advanced computer program, so as to find out the Cup and Size and choose the lingerie which fits to the body. 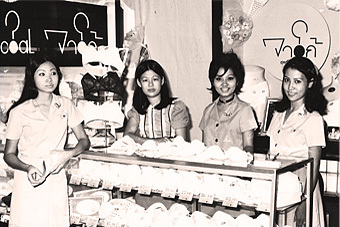 1985 Established the Wacoal Body Clinic at Sogo Department Store, Ratchaprasong to provide special lingerie tailoring service to individuals and persons with special physical features. 1986 Changed the mini computer system to mainframe system to increase efficiency in all departments. 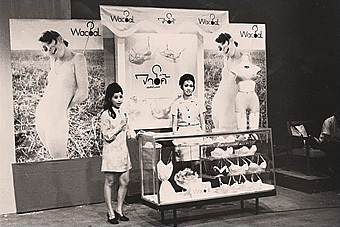 1987 Increased the registered capital to 40 million baht and established the Wien Company Limited to produce lingerie products, brandname: WIENNA in the direct sales system. Currently, the company is the leader in the direct sales system with the most members and changed its name to Wien International Company Limited in 2011. In the Second Decade, this is the age of improvement to management system, business expansion, search for new raw materials sources to provide stability and increase the competitive edge of the company amidst increasing competition. 1990 Introduced highly precise tools and equipment to analyze physiological features such as Silhouette Analyzer, Moire and Sketched Outlines. 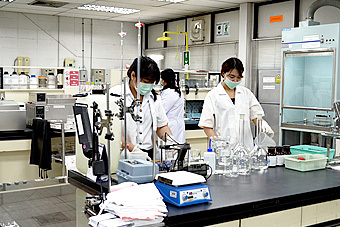 1991 Established the Product Research & Development Center to research, test and analyze the quality of textile materials based on the JIS (Japanese International Standard) as well as research and develop new raw materials. 1992 Provide Clinical Wear Service to individuals, so that the wound dries quickly, treatment for burns, scald wounds. 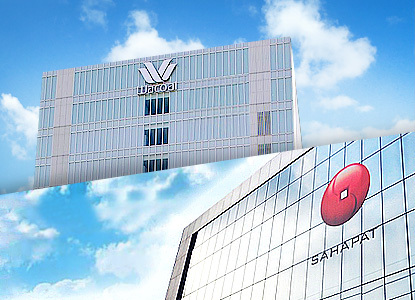 1993 Established 3 more subsidiaries: Wacoal Lamphun Company Limited, Wacoal Kabinburi Company Limited, and Pattaya Kabinburi Company Limited respectively. 1994 Converted to public company limited and increase capital continuously respectively. Currently, the registered capital is 120 million baht. 1997 Starting the Thailand Best Project and promote the products in the group to overseas market by organizing "Sahagroup Export & Trade", which is organized annually until present day. 1999 The company issued 500 million baht bond to reduce the loan from banks. The Third Decade is a test to the strength and management strategy and the company was able to come through the economic crisis steadily. This is the age to meet the demand of customers and use information to develop products as well as expanded production capacity to other regions of the country, so as to conform to the industrial expansion policy to the regions. 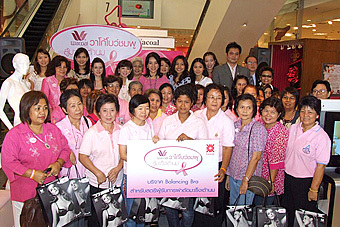 2000 Started the "Wacoal Pink Ribbon Fight Against Breast Cancer Project" campaign to Thai women, so that they become aware to take care of themselves and prevent against breast cancer. 2005 Introduce the customers' demand analysis system: Quality Function Deployment and Kansei Engineering to design products. 2006 Develop new innovation service "Balancing Bra Service", provide tailoring service to women who have lost their breasts and consistently gives Balancing Bra to women who have lost their breasts but could not afford to buy the Balancing Bra. 2008 The company adjust the product image to premium grade, cut the borderline between underwear and casual wear by developing "Diamond Intimacy" as a new product with Swarovski crystal on underwear as first launch. The Fourth Decade is an age of competition. The company marketing strategy is on the offensive, adjusted the product image, implement innovation where consumers are concerned about the environment, laid down solid information system so as to rapidly strengthen internal management and help the management to efficiently manage the supply chain. 2010 Due to the 40th Anniversary of the company establishment, a fashion show Princess Collection under the royal patronage of Princess Siriwannawaree was organized and proceed was donated to build the Breast Cancer Center. 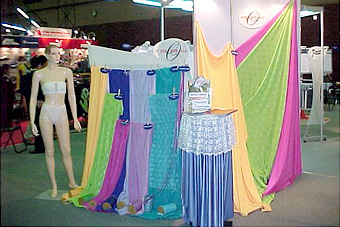 Started to produce and distribute Wacoal Gold, lingerie products for health conscious individuals and elderly women. This is a market base expansion as well as modernized the image of products to suit customers in every age group, as the slogan "40 Years of Deep Understanding towards Women". 2011 Established the Tora 1010 Company Limited to export products to overseas market. Adjusted the organizational structure based on the Lean Organization concept, so that working is highly versatile and can meet the demand of customers quickly. 2012 Collaborate with business partners organize "School of Deep Textile" project which helps develop textile and garment specialists for new business model. Launch brand new product "B'me" and develop wide variety marketing channels to match with the customers' behavior in digital age. 2013 Established Pattaya Myanmar Co.,Ltd. to expand production base in CLMV. Restructure Logistics and warehouse management system to improve efficiency. 2014 Apply Omni Channel marketing concept, connect marketing channels so that customers can access variety of products such as Shop Interactive, Shopping Online, TV Shopping, Call Center, and Social Media, etc. Adjust the Brand Concept under the concept "Beauty Inside". Join with Science and Sports Technology College, Mahidol University to carry out the Project to survey Thai women's body shape throughout the country and establish laboratory to analyze body shapes and products. 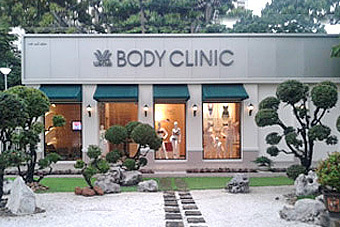 Organize the Wacoal Body Clinic to provide service and consultancy to customer who has problem with body shape with special innovative products which can meet every customer's needs. 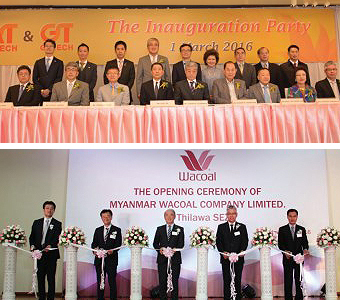 2015 Joint venture with Wacoal Corp., Japan to establish Myanmar Wacoal Co., Ltd. as production base for ladies undergarments in the future. Expand Wacoal Body Clinic Shop branches to various regions so that customers and public can access special products tailoring service. Educate and strengthen Wacoal Sport image, publicize CW-X products for health conscious customers, who love to exercise. 2016 Joint venture with Wacoal Corp., Japan and Saha Pathana Inter-Holding Public Company Limited, to startup A Tech Textile Co., Ltd. and G Tech Material Co., Ltd. to be the base for the production of raw materials for women's lingerie in the future. 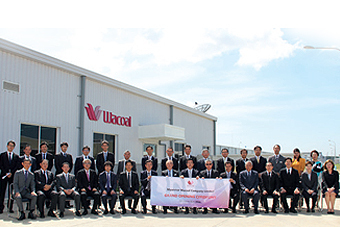 Joint venture with Wacoal Corp., Japan to startup Myanmar Wacoal Co., Ltd. as a base for lingerie production to support the economic growth of the ASEAN Economic Community. 2017 Increased investment in Pattaya Manufacturing Co., Ltd. and became an associated company.